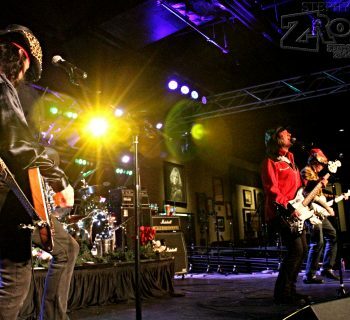 Home›Reviews›Sin City Sinners Rock the House with Bruce Kulick! 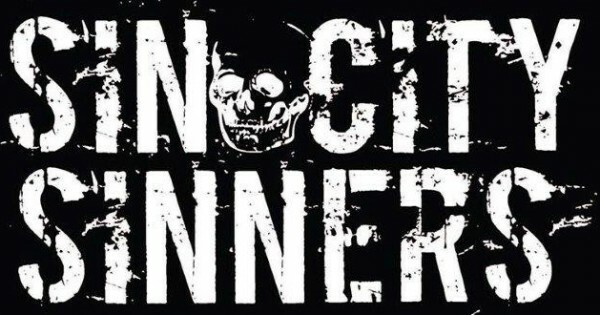 Anyone in town familiar with local favorites Sin City Sinners is well aware that part of their shtick is to have famous rock stars guesting with them towards the end of many of their shows when scheduling permits. And tonight was definitely no exception when it comes to someone noteworthy. The last time this former KISS member joined them was on February 20, 2014, celebrating 40 years of KISS. I fact checked after. And, to me, it seemed like it was in the last six months. My, how time flies, plus the constant onslaught of killer shows at Vamp'd makes everything a blur and boggles the mind. Once again, after a set of tastefully delivered covers along with SCS originals sprinkled in for good measure, it was time for one Bruce Kulick to join the outfit for a smattering of KISS classics and whatever other surprise tunes may be included. An extra treat for me, and probably others who might not have seen the band in the last several months, was their newish replacement, skinsman Blas Elias, formerly of Slaughter and longtime Blue Man Group member. As fate would have it, the first time I saw Slaughter live was on their maiden tour opening for KISS on the latter's Hot in the Shade outing. To have both of these greats share the stage simultaneously was an added bonus. 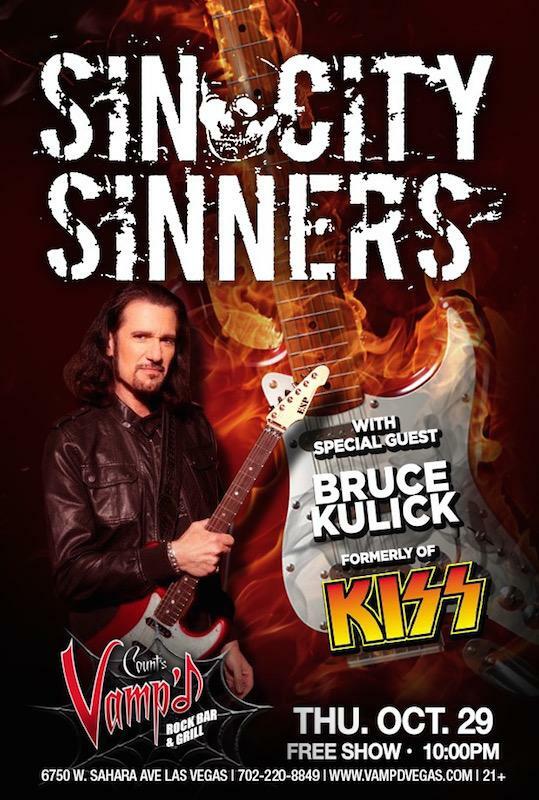 Bruce Kulick was one of the latest in a long line of Sin City Sinners guests. The setlist this time stayed pretty true to the last visit, with two exceptions: One, a couple less songs played, and two, the running order. Launching into the almost obligatory "Detroit Rock City," Josh and company had the audience's attention. This was followed nicely by "Deuce," a favorite off of the NYC act's debut. From here on out, time was allotted strictly to Kulick-era pieces played in chronological order according to initial release date. I have no idea if the band rehearses with their special guests at least once before the performances or is simply instructed to learn the songs a certain way with suggestions for a few twists thrown in last minute; I suppose it can vary depending on both parties' schedules at the time, but it can make for a funny glitch or two come showtime, although most errors are minor and usually laughed off and chalked up to the somewhat impromptu pairing. On "Who Wants to Be Lonely," Bruce, like the last time, quipped about almost remembering how to execute the tricky guitar lead. And Asylum wouldn't be revisited properly without a performance of the lead-off single/MTV video "Tears Are Falling," which all of a sudden had a fourth chorus line instead of three before the second verse. It happens. 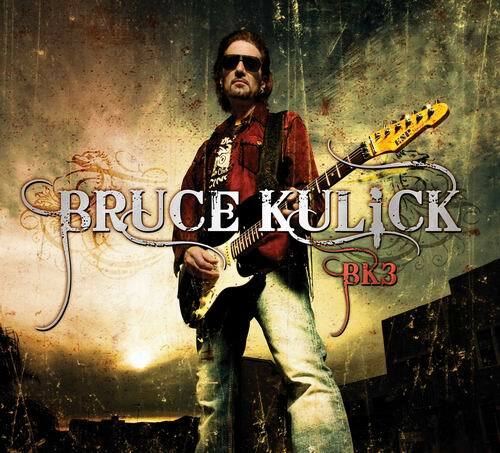 Bruce Kulick keeps busy in his post-KISS career as a member of Grand Funk Railroad, and as a solo artist. 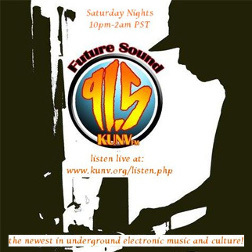 Has latest solo album, BK3, came out in 2010. 1987's Crazy Nights was saluted with the title track before the Sinners executed "Hide Your Heart." This one was preceded by a quick audience call and response intro of the ad lib in the chorus. However, once again a little hilarity ensued due to Joshua Alan reversing it. Anyway, Kulick had a sense of humor about it and instructed them to start the song already and, voila, the choruses were sung properly once the familiarity of the arrangement kicked in. We love you anyway, Josh. The volume of songs you learn every year gives you a hall pass on this minor faux pas. Just in time to give Alan's vocal chords a rest, Doc Ellis took over on Revenge's "Unholy." Scotty Griffin's pipes took over on that LP's "Domino." Of course, no KISS evening would EVER be complete without a reading of the unofficial rock 'n' roll anthem, correct? "Rock and Roll All Nite" it was, to the rescue. For those who haven't been paying close attention to Mr. Kulick's career since the turn of the millennium, he's been the lead guitarist for Grand Funk Railroad since 2001, and I'd definitely recommend that you see them when they're in your city. As such, the night was nicely bookended by GFR's arguably best known tune, "We're An American Band." 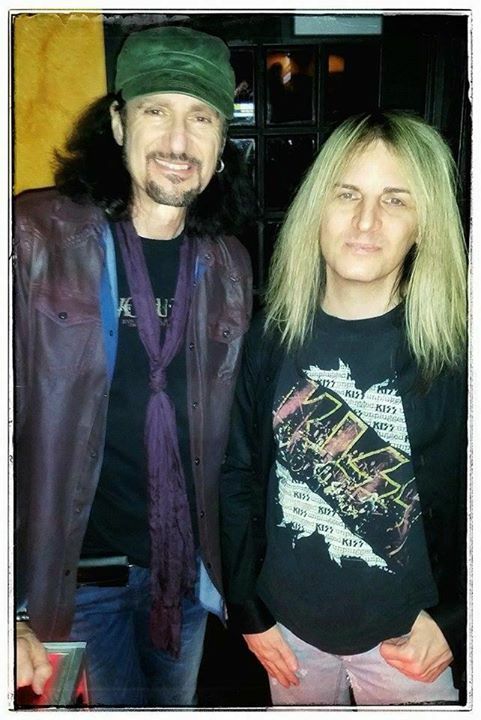 Bruce Kulick (left) with the author of this review. Of course, since we're dealing with professionals here, you can imagine that the set was pretty accurately performed by all five gentlemen onstage. A great gift is that there's no cover charge for these special musical guest performances. It should go without saying that if you weren't in the audience, you missed out. Big time. 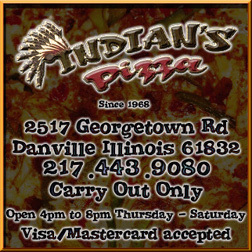 Catch them here on the next local date if you can.